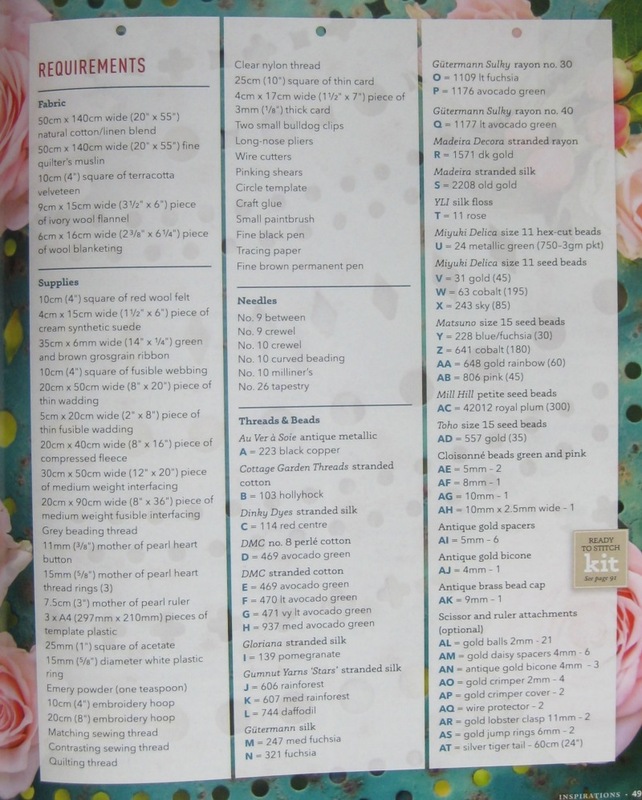 If you are planning to join in with the stitchalong for the Carolyn Pearce Strawberry Fayre heart etui (which I will start in January 2018), then you might like to have a look through these alternative thread lists and substitutions. The design, plus the list of materials, appears in Inspirations magazine number 95. The publishers do sell a full materials pack, but it’s rather expensive, so if you can use your stash, and just fill in with bits and pieces, then so much the better! Some people have been having trouble locating everything that is listed, so hopefully this might give you some ideas for some ‘easier to obtain’ alternatives! 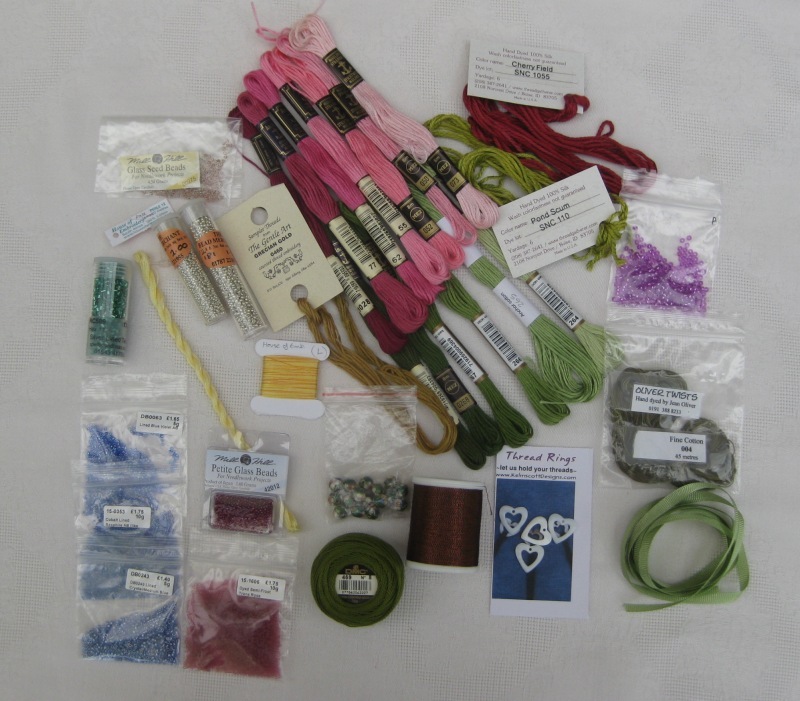 First up is my list of threads and beads that I talked about a while ago – I have decided to use my stash as much as possible, while keeping to the same ‘look’, colourwise, as Carolyn’s. All threads listed as ‘Anchor’ means Anchor stranded cotton (I’ll probably stitch with two strands each time, of the six that the thread comes in). 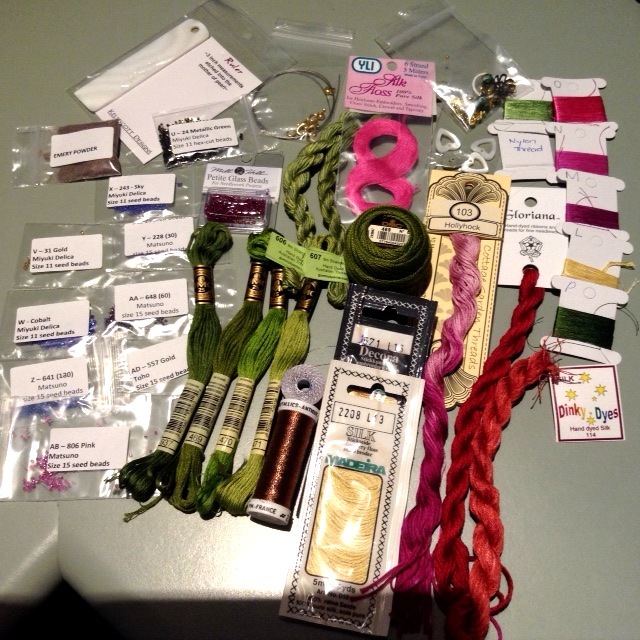 If I plan to use exactly the same thread or bead as in Carolyn’s version, I haven’t listed it here. (U) HEX 589 Silver lined teal size 11 hex beads. W SB0063 Lined blue violet AB delica, size 11. (X) DB 0243 Miyuki Delica Lined crystal/medium blue lustre, size 11. (Y) 1606 Dyed semi-frost transparent rose, size 15. (Z) 0353 Cobalt lined Sapphire AB size 15 (this was a substitute by the Spellbound Beads shop, as what I’d ordered wasn’t available, but it’s really similar to the colour of the beads in one of the other packets, so I’m not sure if the colour difference is too close to work). The mother of pearl heart shaped thread rings I bought from Fobbles. The elusive mother of pearl ruler I eventually got from My Special Stitches in the USA, but they are now sold out (October 2017). You can buy the Anchor threads and some beads from Sewandso, and the rest of the beads from Spellbound Beads of Lichfield, Staffordshire. I will be using the Robert Kaufman Essex cotton/linen blend fabric in Natural (the same as Cynthia, below!) – I got mine from Cloud Craft. (R) Cynthia was not able to find Madeira Decora 1571, but will use a dark gold silk floss. Wadding is what, in the USA, is called quilt batting. Template plastic, also called Mylar, can be found in stores that sell quilting tools and materials. If anyone would like to send me their list of substitutions, plus an image of everything that they’ve chosen (particularly if you choose to use a different colourway than Carolyn’s pink and green one), I’d love to add it to this post! Just email me at janet@janetgranger.co.uk. Images need to be in .jpg format, and at least 500mb please, to show the detail. Carolyn Pearce Strawberry Fayre heart etui 4: urgent ruler announcement!!! 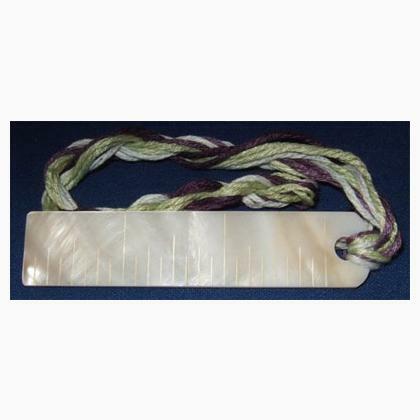 The Carolyn Pearce Strawberry Fayre etui requires a mother of pearl ruler for one of the pockets inside the etui. These mother of pearl rulers are getting so hard to find though – several people have given me website details where they believe there is still stock of them left….only to find that the shops have none left, or the shop itself has closed down, and so on. EDIT – This one sold within 10 minutes of me posting this, sorry! BUT….I have found ONE shop that has JUST ONE LEFT – so, if you’re quick, whoever can contact them first, gets it!!! (Obviously, I’ve already bought mine 🙂 ) It costs 10 US dollars, plus shipping. So, contact Penny at My Special Stitches spclstitches@centurytel.net for what appears to be the last mother of pearl ruler in the world! Author Janet GrangerPosted on October 12, 2017 October 19, 2017 Categories 01. Getting startedTags Carolyn Pearce, Embroidery, Etui, Hand embroidery, Heart etui, Strawberry Fayre11 Comments on Carolyn Pearce Strawberry Fayre heart etui 4: urgent ruler announcement!!! 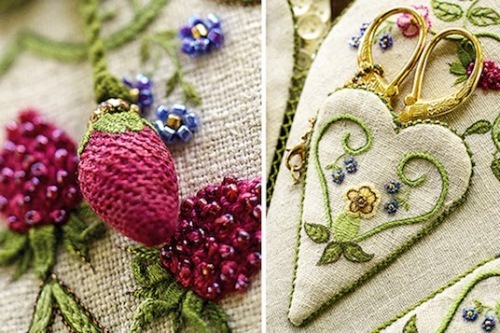 Carolyn pearce Strawberry Fayre heart etui 3: some more goodies have arrived! 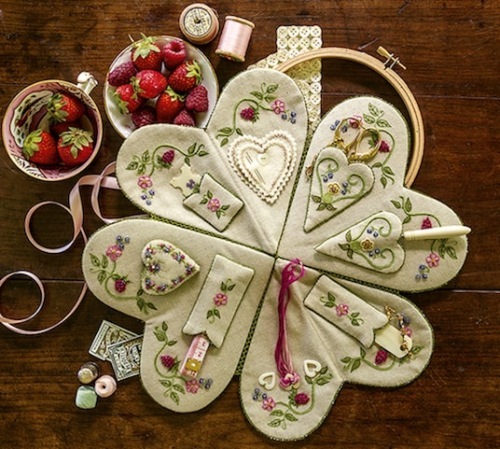 I’m gradually getting all the materials together to start this gorgeous Strawberry Fayre heart etui project, by Carolyn Pearce. The design appears in Inspirations magazine number 95. 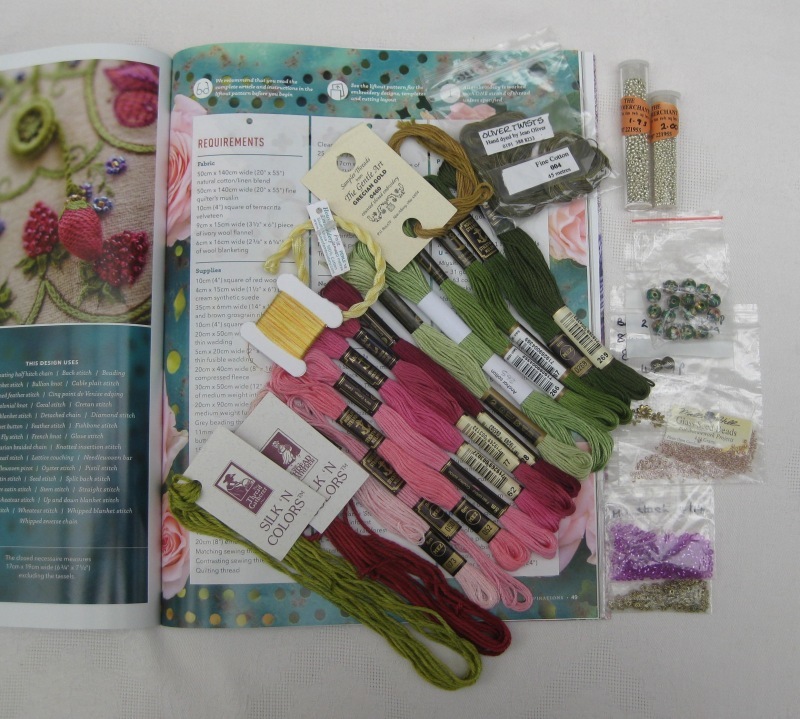 In my last blog post, I talked about how most of the materials were substituted from my stash, to keep the cost down for this project, although there is a materials pack available from Inspirations, if you prefer to go that route (but it’s a bit on the pricey side!). 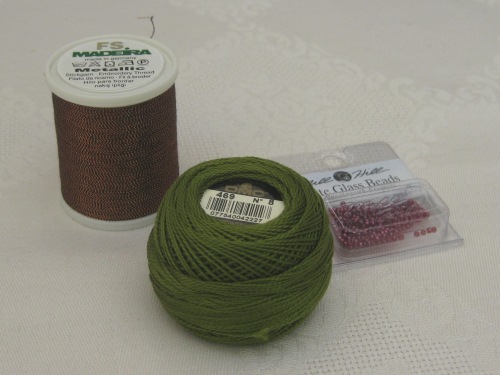 I ordered some lovely metallic thread, a ball of DMC perle 8 (shade 469) in a mossy green, and some Mill Hill beads (42012 Royal Plum), from Sew and So. The metallic thread is wonderful – really fine, with a copper and black twist – very similar to the Au Ver a Soie 223 Black copper antique metallic thread that Carolyn suggests in her list, but I couldn’t get that. This substitute is supposed to be for machine embroidery, so is fine, but very strong, and I’m really looking forward to using it. It’s Madeira Metallic 20, shade 428 Copper. It was rather expensive at £7.52 plus VAT, but it’s a beautiful shade. 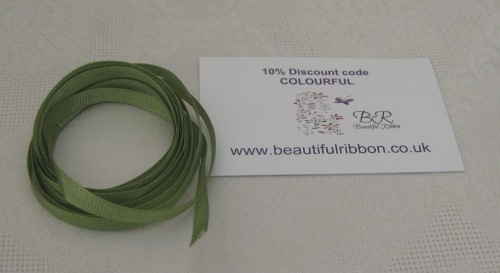 I managed to find this lovely grassy green grosgrain 6mm ribbon on the Beautiful Ribbon website – it took me ages online to find a green that wasn’t really bright, but this one is a lovely shade, and it’s a soft ribbon to hold, too. I bought two metres, which should be plenty. 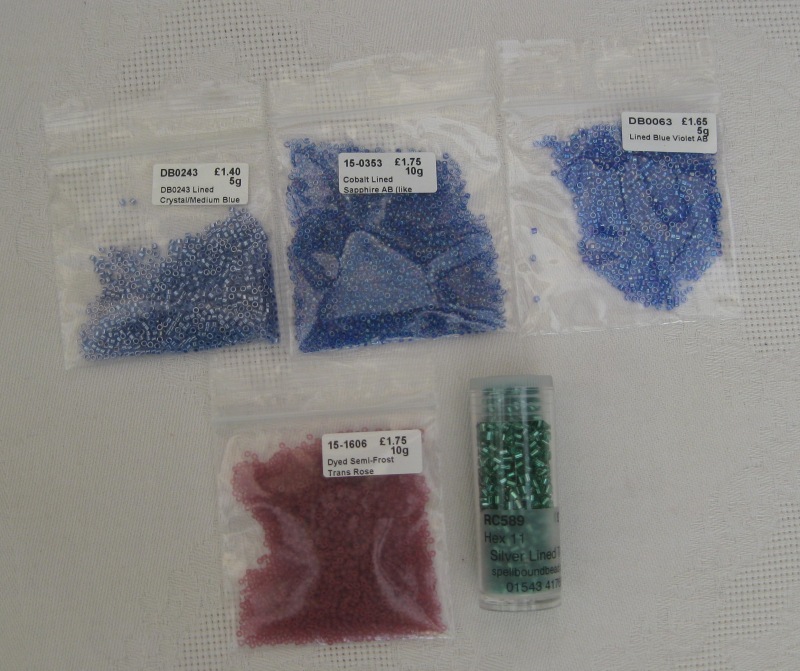 DB 0243 Miyuki Delica Lined crystal/medium blue lustre delica size 11 ( ‘X’ on the materials list – exact match). 0353 Cobalt lined Sapphire AB size 15 (this was a substitute by the shop, as what I ordered wasn’t available, so it’s really similar to the colour of the beads in the next packet, and I’m not sure if the colour difference is too close to work). This is for ‘Z’ on the list. SB0063 Lined blue violet AB delica size 11. 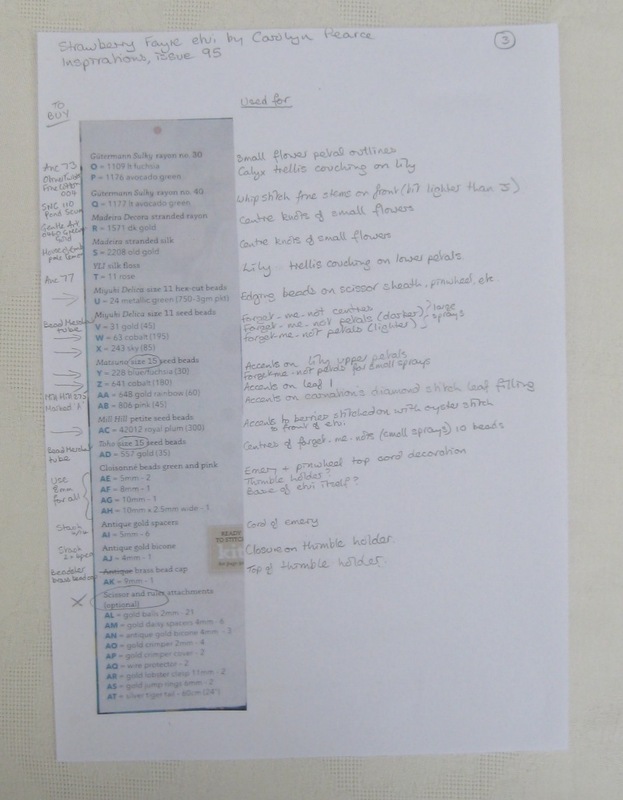 ‘W’ on the materials list – exact match. 1606 Dyed semi-frost transparent rose, size 15. A substitute for ‘Y’ on the materials list. HEX 589 Silver lined teal size 11 hex beads. Substitute for ‘U’ on the list. The ones substituted are because it has proved to be impossible to get Matsuno beads in the UK in the shades I need, but I think these beads will work really well instead. In case you were wondering what the ‘rather pricey’ materials pack that Inspirations magazine sell looks like, Jo from Australia sent me some pictures of the pack that she bought! It’s really interesting to see. She’s even got one of the elusive mother of pearl rulers in her pack (although they are supplying them for a slightly cheaper price without the ruler, as the rulers are unavailable worldwide, now). It’s interesting to see the bits and pieces all together. The copper metallic thread at the bottom is very similar in colour to the one I have just bought, which is good! Here’s the ‘fabrics’ part of the pack that Jo bought. 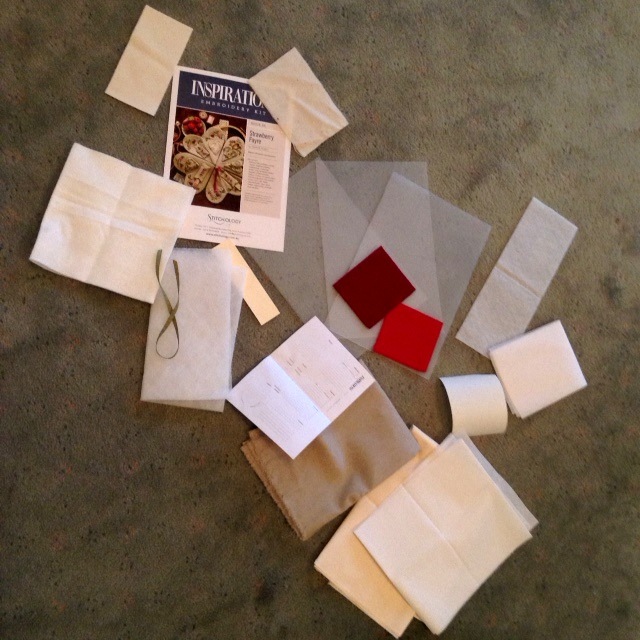 Lots of different fabrics, wadding, acetate, etc., all cut to the sizes listed on the pull-out sheet. So, I’m getting closer to being ready to start this project, now. But I still need to get the cotton/linen blend fabric, and a long thin thread winder for one of the pockets. I hope that doesn’t end up being as difficult as the ruler, which is still proving impossible to get, although I’m on to a couple of leads on that front….. Author Janet GrangerPosted on October 12, 2017 October 19, 2017 Categories 01. Getting startedTags Carolyn Pearce, Embroidery, Etui, Heart etui, Strawberry Fayre9 Comments on Carolyn pearce Strawberry Fayre heart etui 3: some more goodies have arrived! 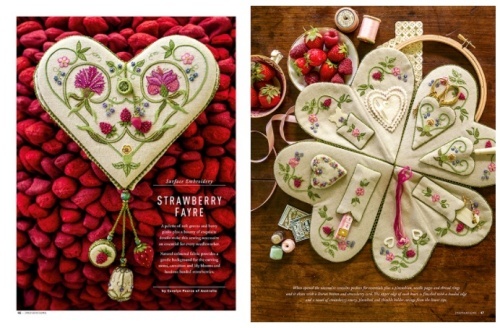 A few weeks ago, I mentioned that I’m going to start stitching the amazing Strawberry Fayre heart etui design by Carolyn Pearce, which has just appeared in Inspirations magazine issue 95 (September 2017) , and that I had the idea of doing it as a stitch-along, for anyone who’s interested – and quite a lot of you are! I’m thinking of starting the stitching on this after Christmas – towards the end of January, probably. But that doesn’t mean that I’ll leave it till then to start collecting the materials together – in fact, I’m doing that bit now! This project has quite a lot of threads and beads in it. Inspirations magazine is selling a materials pack for the project, so you could simply buy that….but it’ a bit pricey! It’s 241 Australian dollars / £142 / US$193, plus shipping. However, that does mean that you would get absolutely EVERYTHING that you need (except the ruler) – even after just a quick scan through the list of what’s required, I realised that some of the items would be difficult for me to get here in the UK, as our needlework industry has virtually collapsed these days, and we don’t have much choice here. Buying things from overseas can work out very expensive, shipping-wise. Anyway, I’ll go through the process that I have followed to start collecting the materials up – you might want to use my checklist, or make your own. Let me know in the comments if you have a different system! What I do first with a detailed project like this one, is to scan the Requirements page from the magazine. 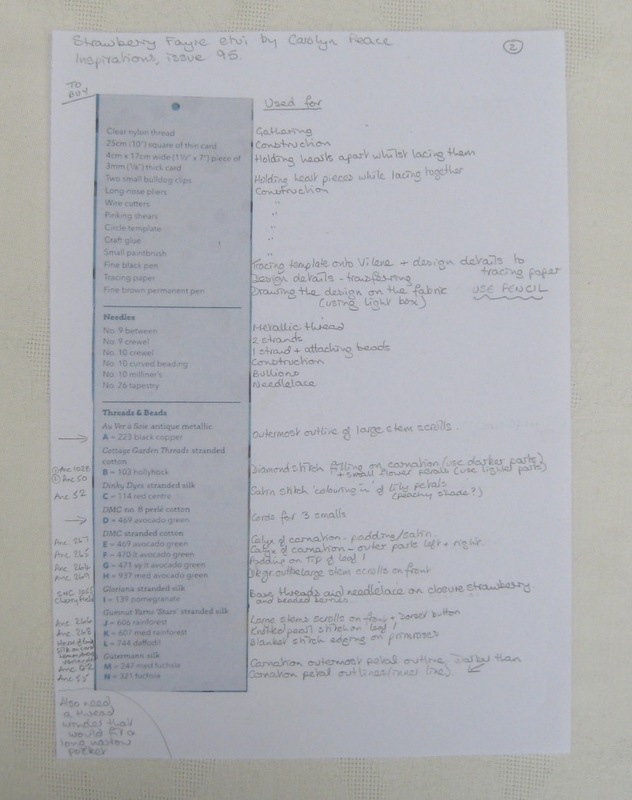 Then I print it out, cut it up, and tape each column of materials to a sheet of paper so that I have one column of materials to match to at a time, and I can make comments alongside. This is easier than keying it all into Excel, and means I don’t make any mistakes and leave something crucial out! Then, the time-consuming part is that I read through all of the instructions for the project, and mark on my list where each colour of thread, type of bead or construction material is used in the project, as the requirements list itself doesn’t tell you. This took me several hours. It’s then much easier to see if, for instance, a colour is used for just a tiny detail, or if it’s used for major design elements (you might even need to buy multiples skeins of one colour, if that is the case). I don’t list EVERY instance of where a thread is used, just the first time I come across it, so that I can look at the magazine images and gauge what the shade actually is, and estimate how often it’s used. One person’s ‘avocado’ is another person’s ‘moss green’, for instance! Then I go through my stash, to see what I can substitute with. I love this bit. I don’t mind spending ages on this stage. I took a whole Sunday choosing the threads and beads for this. 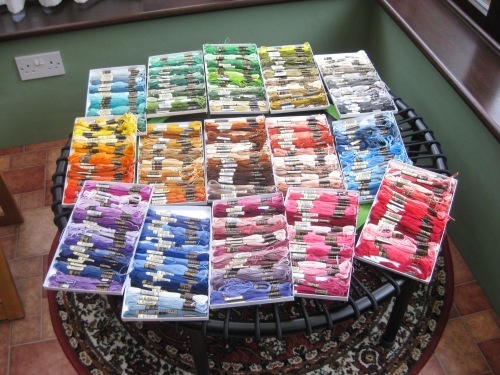 Mostly, I chose Anchor stranded cotton, as I use that for my dollhouse needlepoint kits, so I have the whole range of skeins already. The magazine article suggests DMC for much of it, so if you have that in your stash, you can easily use those threads. I keep all my Anchor skeins in shallow trays, stored in a vintage wooden cabinet, so when I’m choosing threads for a project, I get all the trays out and spread them around – here they are, on the rebounder in my conservatory. The rebounder makes a good table for these, and at least it’s getting some use doing this, as it certainly doesn’t get me jumping up and down on it much!!! The article gives a list of which types and sizes of needles you’ll need, but bear in mind that if you substitute threads, you might need different sizes of needle. I’ve decided already that I won’t make the beaded ‘dangles’ for the scissors and ruler in this project, so I’m not collecting materials for those (which are listed separately in the materials list, fortunately, so they are easy to spot if you also want to leave those out). Although this project has a three inch mother of pearl ruler as one of the sewing items in the etui, I have found it impossible to buy one in the UK so far. Inspirations magazine must also be having trouble sourcing these, as their materials pack doesn’t include one. If anyone knows of a website or shop that actually has one (rather than saying they do, but they are actually out of stock with no hope of ever having any again! ), please let me know. Otherwise, I think I might substitute a bodkin for the ruler, or maybe a laying tool of some kind. I also read through all of the construction/assembly instructions (including the pullout sheet) at this stage, so that I am really clear about how all the construction materials are used. 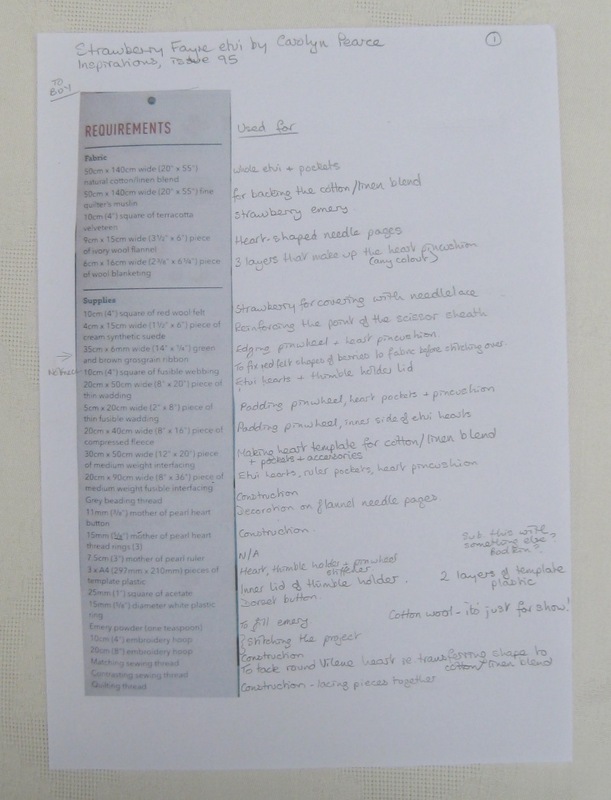 Sometimes, you can make simple substitutions here, such as using cardboard, which is easily available, instead of acetate sheet, which maybe isn’t. From reading through the instructions, I have already decided that I’ll probably slice the acetate stiffener for the inner heart shapes in two, and join them with masking tape or something, to make a flexible hinge, as I don’t like the suggestion in the instructions of IRONING the fold of the fabric/acetate sandwich. Ironing acetate, sandwiched between embroidered fabric that took you hours to stitch?! Wouldn’t that melt it? Too risky for me! That’s why it is so helpful to read everything now – it gives you time to work out solutions to possible problems. 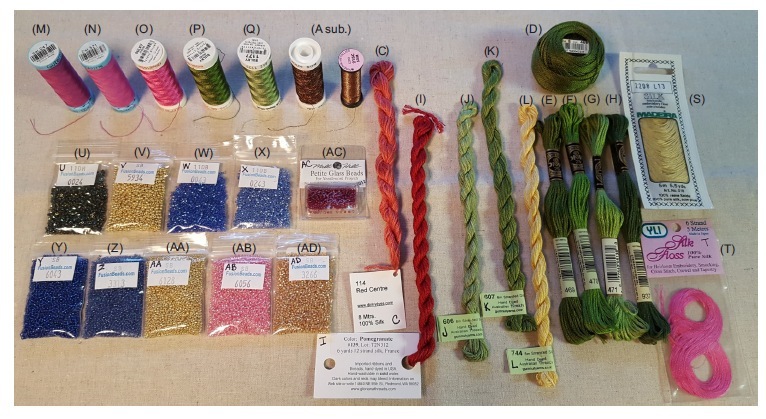 Having selected all the threads and beads that I could from my stash (and written my choices in the left hand column on my sheets), I was left with some things that I need to buy – these are marked with an arrow in the left hand margin on my sheets, as soon as I realise that my huge stash has failed me! I can then search online for the products, and make substitutions again if things aren’t available. With the beads, I found it impossible to find a supplier of the Matsuno size 15 beads in the correct colours, for instance. At the moment, I’m waiting for interesting little parcels to arrive from various suppliers, so I’ll show you what I’ve ordered once they have arrived. And I still need to decide on the fabric – probably a back to front way of doing things, but I’m only after a cream cotton-linen blend, which should be quite easy to co-ordinate things with. I need a trip to a fabric shop for that….